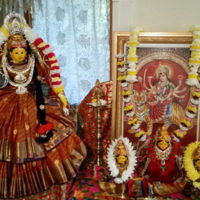 Goddess Lakshmi is the chief deity of this bountiful Havan. Lakshmi means in Sanskrit “to perceive or observe.” This is synonymous with Lakshya, meaning “aim” or “objective.” She is the one who has the object and aim of uplifting mankind. 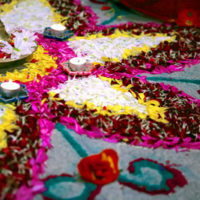 Lakshmi is the Goddess of light, beauty, good fortune, and wealth. Being the consort of Vishnu, Lakshmi also signifies love and grace. While Lakshmi is generally worshipped to achieve success, she does not reside long with anyone who is lazy or desires her only for wealth. There is nothing in this world difficult to be procured by devotees of Goddess Lakshmi. 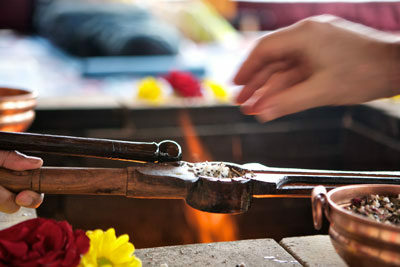 Dhanam-Agni, Dhanam-Vayu, Dhanam-Suryo, Dhanam-Vasuh… “Dhanam” means wealth. We can get wealth in many forms using the different principles of Nature. 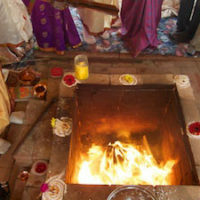 So, those who want to gain wealth in particular areas should have this Havan, which uses the above mantra, performed.